What is Schutzhund and IPO ? German Shepherds seem to dominate many of the Schutzhund shows although a wider variety of breeds can participate and often do in IPO shows. 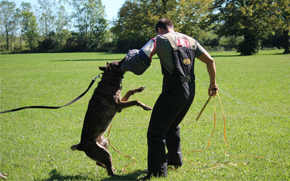 Any breed can technically be trained in Schutzhund work, but as any trainer knows, not all individual dogs and not all dog breeds are suitable for this work. It truly is a test of a dog and requires a high level of ability in several areas. What are the Components of Training and Trialing? The public often has a misconception about what this type of training is. They often see photos of dogs doing bite work and see an aggressive and potentially dangerous animal. What they don’t know is how well controlled these dogs must be. 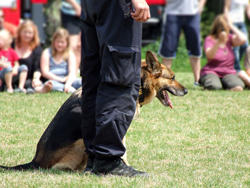 As opposed to some police dogs and personal protection dogs that don’t require quite as much provocation, Schutzhund dogs are required to be tightly trained and as a general rule are quite safe in the public. Most people are actually astonished when they meet one! They also frequently don’t realize that training is comprised of three areas with protection work only being one of those areas. It is important to note that temperament is a very important aspect in all levels. There are multiple things that are integrated into the testing for evaluating temperament. If a dog cannot pass these elements (by showing fear, nervousness, extreme aggression, sound reactivity, weaker nerves, etc.) he will not be able to pass a test. What are the Levels of Titling? There are multiple levels of titles that represent progressively harder levels of work. For each title, there are 300 points available (100 points in each of the three components of obedience, tracking, and protection work). In order to title, a dog must successfully acquire at least 70 points (70%) in tracking and obedience and at least 80 points (80%) in protection. Of course the goal is to score as highly as one can! BH: This is a first level for everything else. It is to test obedience and traffic sureness. WH: This is a watchdog test for alertness. AD: This is an endurance test to test a dog’s physical ability and stamina. SchH A: This is only obedience and protection work. Dogs should be 15 months old for BH testing, 16 months old for FH and AD testing, 18 months old for SchH A and SchH1, 19 months old for SchH2 and lastly, 20 months old for SchH3.